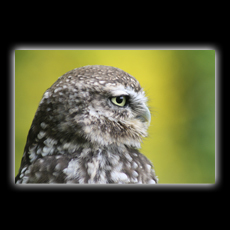 On this page, you will find our list of species of the Birds of Prey and a number of Corvids that we currently have at Falconry Scotland. Hawks & Buzzards, Falcons, Eagles and Corvids to provide you with an insight about their differences. growth of strong new feathers. 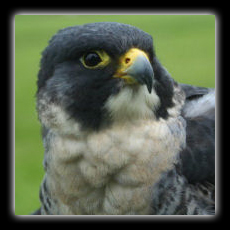 We can also provide any of our birds with an experienced falconer for television productions. 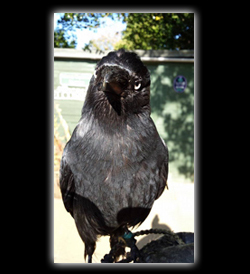 In fact, some of our Corvids starred in the CBBC's children's adventure series, 'Raven', and also starred in Season 1 of the popular Starz television series, 'Outlander'! To enquire about using our birds for television productions, music videos, art work etc. please contact us. Please note that we are currently developing a page for our 'Film, Music & Other Media Work' of which our birds are available for. please contact us via e-mail for further information, thank you. Owls are Birds of Prey which belong to the order known as Stragiformes, which includes approximately 240 species of Owl. It is widely believed that all Owls are nocturnal (active primarily at night), however this is a misconception. You can tell generally when an Owl is primarily active by the colour of their eyes; an Owl with dark eyes means they are Nocturnal, an Owl with orange eyes means that they are primarily active at dusk and dawn (known as Crepuscular), and those Owls with yellow eyes are Diurnal, meaning that they are primarily active during the daytime. 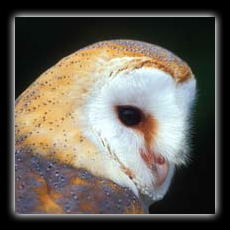 The order Stragiformes is split into two families; we have the Tytonidae family which probably the most known Owl in the World belongs to - the Barn Owls, of which there are currently 18 known species of Barn Owl spread across the World. We also have the Strigidae family, to which the rest of the known amount of species of Owl belong, of which include another of the Worlds most wide-spread of Owls - the Tawny Owl. One special characteristic of Owls is their ability of silent flight. The smallest species of Owl in the World is the Elf Owl, standing at an average of 5in and weighing an average of 1.4oz, whereas the largest species of Owl, the European (or Eurasian) Eagle Owl stands between 22 to 30in and weighs between 3 to 11lb (range is that of between a male & female - the female being larger). 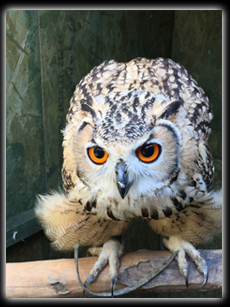 You will find below the species of Owls that we currently have in our collection, along with information and photographs of each species. The Barn Owl is one of the most widely ranging species of Owl, found on nearly every continent except the Artic and Antarctic. They are found in Britain and are a popular symbol of British wildlife, but unfortunately their numbers are as low as 4000 pairs across the UK due to loss of habitat and a lack of hedgerows in modern open field systems. There are also less open barns for the Barn Owl to roost and nest in, although this is something that is changing with more nest boxes being put up and more farmers once again opening their barns to the "farmer's friend". While the Barn Owl is a nocturnal hunter, it is frequently seen in the summer months in the early evenings gliding over the fields in daylight. As they fly over the field, they direct their disc-like face towards the ground which helps to amplify their hearing. The Barn Owl is the only Owl which has been proven to be able to hunt effectively in an area scientifically sealed off from all light, meaning they can only rely on their sharp ears. The Barn Owl's diet is made up almost exclusively of small rodents up to the size of rats. The Tawny Owl is the most common British species of Owl, with around 20,000 pairs across the UK. They come in two distinct colours of plumage, the Rufous phase which is a gingery brown with white flecks, and the Grey-Face phase (pictured) which is grey with white flecks. 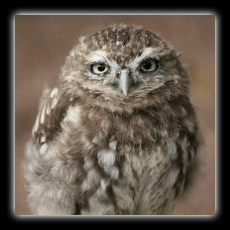 It is probably most well known by sound, giving the distinctive "twit-twoo" call associated with all Owls. However, in reality it is a pair making this call, with the female calling "ke-wick" and the male answering with hooting. The Tawny Owl has proven itself adaptable, and has been able to move from its traditional countryside habitat into woodland, parks, gardens and even cities. Accordingly, it has expanded its quarry list from mice, shrews, voles and rats to include squirrels, small birds, and even Sparrowhawks and the slightly smaller Barn Owls. The main hunting method of the Tawny Owl is to find a tree or post to sit in, then look and listen until prey is pin pointed, before gliding silently in for the kill. Using this method they are very successful hunters, but Tawny Owls have even been observed applying this tactic to fish in a stream with some success. The Asian Brown Wood Owl, or commonly known as the Brown Wood Owl, originates from South Asia from India, Bangladesh & Sri Lanka, from east to west Indonesia and the south of China. The Brown Wood Owl belongs to the same family of Owls as, for example, the Tawny Owl (Strix aluco) - the 'typical owls'; of which the majority of Owls belong, and is part of the genus 'Strix', of which the earless Owls belong. It is indentified as a medium-sized Owl and is uniformly dark brown in colour, with its shoulders presenting faint-white spotting, and its underparts, for instance its chest plumage is buff with brown streaks. Its facial disk is brown-to-rufous in colour, with a white band ranging from above and around its eyes to its neck. 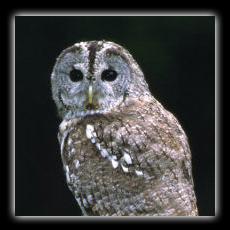 The Brown Wood Owl has dark brown eyes and is a strictly nocturnal Owl, and feeds on small mammals, birds & reptiles. Like Tawny Owls, it nests in the hole of a tree or within a forked tree trunk and will usually produce 2 eggs in the breeding season each year. 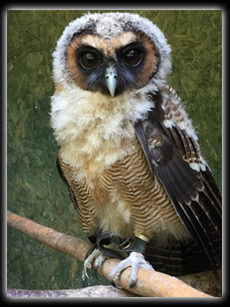 Our [Asian] Brown Wood Owl, "Bailey", is now flying free and is flying in our experiences to customers! Should you wish to see some photos & information about "Bailey" during his rearing & training, please check out our What's New? page! 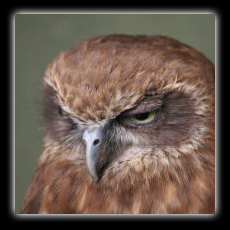 The Boobook Owl is found across Australasia, with a subspecies, the Morepork, found in New Zealand. It is the most common species of Owl found in Australia. They are a member of the Hawk Owl family, who have a more streamlined shape than most Owls as well as having an extra primary feather on each wing. This allows them a speedier flight style. The Boobook Owl is named for its whooping call. Strangely, it is named the Morepork in New Zealand after the same call. It is an agile, swift flyer capable of catching slightly faster prey, and in addition to a basic diet of small rodents they will also frequently catch small lizards. Small birds, bats and insects are occasionally caught in midair. The European Eagle Owl is the largest species of Owl in the world, and is found native to forested regions across continental Europe. This formidable predator can easily match the strength and hunting capability of an equivalent eagle, and has a varied diet, consisting mainly of small rodents, rabbit and hare. It is also capable of taking prey as large as a small fox or deer when necessary, using its huge, powerful feet and sharp talons. 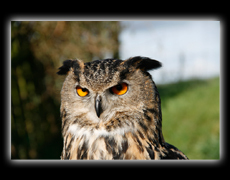 The tufts on top of the European Eagle Owl's head are often thought to be ears, but they are just feather. The ears are hidden underneath the feathers at the sides of the face. The tufts are useful for camouflage - when the Owl feels threatened it will stand tall, draw in all it's feathers to appear thinner, and stick the tufts up in the air. Sitting in a tree, it quickly becomes a piece of bark against the trunk or a branch. If the threat comes too close, the Owl makes a terrifying transformation, puffing out their feathers, putting the wings up behind their head and making a loud clicking sound with the beak. The Turkmenian Eagle Owl is found native to Eastern Europe and Central Asia. It is a sub-species of the European Eagle Owl, the largest species of Owl in the world. These powerful Owls hunt aggressively and take a wide range of prey, from small rodents such as mice and rats, to their most common quarry of rabbit, up to much larger quarry of foxes and small deer. Although the larger quarry species will weigh far more than the Turkmenian Eagle Owl, the Owl relies on the crushing power and sharp talons of its feet, which are capable of crushing with over 200 pounds of pressure per square inch! Like many Owls, the Turkmenian Eagle Owl hunts successfully using a combination of binocular eyesight, hearing able to pinpoint the location of sounds accurately and soft feathers which give silent flight. The Siberian Eagle Owl can be found in the west and east of north Siberia. It is, like the Turkmenian Eagle Owl (see above), a sub-species of the European Eagle Owl (see above); making it one of the largest species of Owl in the world. It is a lot paler in colour to that of its cousins, generally appearing in an off-white plumage with blackish streaked markings from the crown, hindneck and underparts. On average, males can weigh between 31/2 to 7lbs, whereas females weigh, on average, between 5 to 10lbs. 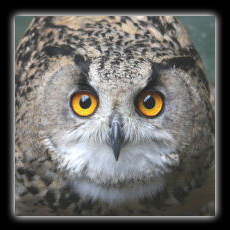 Their prey consists of, like other Eagle Owls of its size, rats, rabbit, small deer & foxes and alike mammals. In the wild, they normally breed in springtime and may lay up to 4 eggs with an incubation period of approximately 30 days. The Bengal Eagle Owl, or otherwise known as the Indian Eagle Owl ( or the Rock Eagle Owl ), is a large-sized Owl (although compared to other Eagle Owls, it is farely small in comparison), which looks remarkably like and was once considered a subspecies of the European Eagle Owl (Bubo bubo), although it half its size in both height and weight. They are normally found in hilly or rocky scrub forests (hence the name - Rock Eagle Owl), and are usually seen in pairs. ranging from within the mainland of the Indian subcontinant and south of the Himalayas. They are 'Crepuscular', meaning they are normally seen or heard at dawn and dusk. Their diet consists of mammals and birds, from mice, rats, rabbits, to partridges & doves. The breeding season in the wild can range from November to April and on average produce 3 to 4 eggs which hatch at around 33 days and the chicks are dependent upon their parents for almost 6 months. 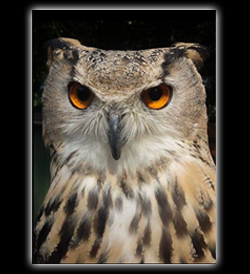 Our Bengal Eagle Owl, "Byron", is now flying free and is flying in our experiences to customers! Should you wish to see some photos & information about "Byron" during his rearing & training, please visit our What's New? page. 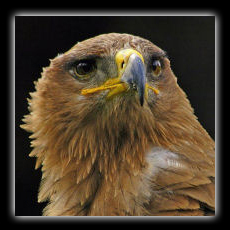 Hawks and Buzzards belong to the order Accipitriformes and the family known as Accipitridae (of which Eagles, Harriers and Kites also belong). “True Hawks” (the genus Accipiters), which belong to the sub-family known as Accipitrinae, include Goshawks, Sparrowhawks, the Coopers Hawk, Sharp-Shinned Hawks and others. Buzzards belong to the genus Buteo from the sub-family known as Buteoninae, which include the Common Buzzard, Red-tailed Buzzard, Ferruginous Buzzard, Jackal Buzzard and others. In America, for example, Buzzards are also referred to as Hawks; eg. the Red-tailed Buzzard as we in the United Kingdom refer are known as Red-tailed Hawks in America. 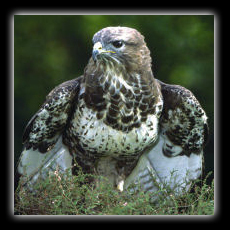 "True Hawks" are referred to as Shortwings and Buzzards are referred to as Broadwings. Shortwings are characterized by having short wings and long tails whereas Broadwings are characterized with having long, broad wings and long flight feathers. In case you are wondering why we have enclosed "True Hawks" within speechmarks is because this is the term often referring to the Accipiter genus of Hawks, whereas the species Harris' Hawk does not belong to; the Harris' Hawk belong to the genus Parabuteo (more information about the Harris' Hawk can be found below). 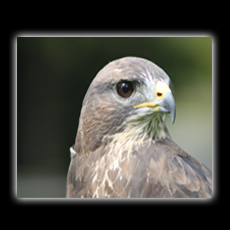 You will find below the species of Hawk & Buzzard that we currently have in our collection, along with information and photographs of each species. The Harris' Hawk is found native to South America and the Southern States of America, with Texas and Arizona being well populated areas. They were discovered by the great ornithologist Audubon in the 1860's in Arizona and he named them after his good friend and companion on the trip Colonel Edward Harris. 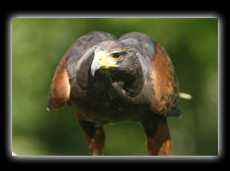 The Harris' Hawk is a fascinating bird both in captivity and in the wild as it is the only bird of prey to hunt co-operatively in a pack, with normal pack sizes consisting of three to six birds and packs as large as fifteen birds being sighted hunting. By hunting together they can both successfully flush and pursue quarry thus greatly increasing their chances of success and survival. A common hunting scene in Texas is for the larger female Hawk (capable of holding the large jack rabbit that is often chased) to wait up above in a tree with others in the pack, watching carefully as a smaller, more agile male runs around on his long legs in the brush trying to flush out prey. Should he succeed the pack are ready and waiting to give chase as soon as the quarry chooses to bolt. The Harris' Hawk is also unusual in how it rears it's young. The vast majority of raptors will drive their young from the nest shortly after fledging when they can hunt for themselves. However the Harris' Hawk young will stay with their parents for a year, learning how to hunt with their parents, and potentially will stay with the pack for longer. In captivity, because of their sociable and intelligent nature, the Harris' Hawk is an exciting and fascinating bird to fly. They are also incredibly versatile flyers, being able to soar and glide over open ground as well as weave quickly and with great agility through the forest. The Common Buzzard is a species native to Britain and Europe. With over 60,000 pairs, the Common Buzzard is the most common British bird of prey. They are just as frequently seen circling near the motorways and roads looking for road kill as they are seen out on the hills. With small feet in proportion to their body, the Common Buzzard prefers to scavenge where possible, although they are perfectly capable of taking rabbit or pheasant as well. The Common Buzzard is a broadwing, with long, broad wings to allow them to soar on thermals and glide with very little energy waste. This means a Common Buzzard can cover a large territory searching for prey down below as soaring without wasting the energy needed for the chase. Falcons belong to the order Falconiformes and the family Falconidae, which comprises of around 60 species of birds of prey (not just Falcons). There are 37 known species of Falcon in the genus Falco, of which are widely distributed across the World, except from Antartica. Falcons are referred to as Longwings because of their characteristic long pointed wings and narrow tails. Male Falcons are referred to as tiercel’s and females are referred to as purely falcons; the term tiercel is from the Latin word tertius, meaning third - as a male falcon (or any bird of prey) is approximately one third smaller than the female. Falcons typically kill their prey by utilizing a "tooth" on the side of their beak; this is known as a tomial tooth, unlike Hawks, Buzzards & Eagles who typically use their feet. It is widely known that Falcons are the fastest family of Bird of Prey; Peregrine Falcons have been recorded stooping (diving) at speeds of around 200mph, making the Peregrine the fastest-moving animal in the World. Most falcons hunt primarily 'on the wing', meaning that they hunt at speed in the sky, although the Kestrel primarily hunts its prey by hovering - waiting for the right moment to stoop (dive) down on its prey. 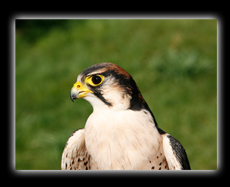 You will find below the species of Falcon that we currently have in our collection, along with information and photographs of each species. The Peregrine Falcon is one of the world's most widespread Falcons, and is not only native to the UK but found as far afield as Australia and South America. These incredible birds of prey are the fastest animal on earth and have been proven capable of reaching over 270mph in the stoop, a nearly vertical dive towards the quarry! The Peregrine catches exclusively feathered prey in midair using this technique. Birds taken can range from small songbirds to medium sized waterfowl such as ducks. For hundreds of years the Peregrine Falcon has been highly prized by the Falconer and during the medieval period they were favoured as birds suitable for princes and nobility to hunt with. The Peregrine was so highly valued that it was frequently used to barter for land - with a piece of land near Haddington being sold for a pair of Peregrines and a pair of Gyr Falcons in the 16th century. Despite facing a drop in numbers during the 20th century, mainly due to pesticides, the Peregrine is making a remarkable recovery and has proven itself a resilient and adaptable predator, with a pair even taking up residence in a New York skyscraper preying on the local pigeons! The Lanner Falcon is a close relative of the Peregrine Falcon, however it is smaller and not capable of reaching the extreme speeds of its cousin. The Lanner also has a distinctive red "cap" on the top of its head. They are found native to Africa, with a small number also found in southern Italy and Greece and Asia Minor. Like most Falcons, the Lanner prefers to pursue and take feathered prey in midair. Occasionally it has been known to attack small rodents and lizards on the ground. As it is a smaller species of Falcon, the Lanner mainly predates on small songbirds and doves. It was famous to the Ancient Egyptians as the "Sun Falcon", due to its clever technique of flying with the sun behind it to ambush unsuspecting birds. The Ancient Egyptians believed that the Lanner actually descended from the sun itself to attack, possibly a link to the Falcon-headed sun god Horus. 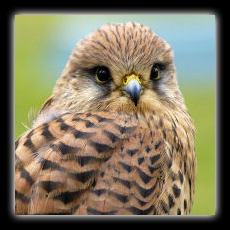 The Kestrel is one of the most common British birds of prey and is certainly one of the most frequently seen. This small Falcon is distinctive for its hovering flight, often seen today hanging still in the air at the sides of roads. Their preferred prey is small rodents including mice, shrews and voles although very occasionally they will also take small birds. When a Kestrel is seen hovering above a grassy verge, she is on the lookout for rodents down below, ready to stoop down and grab them before carrying them away to a favoured eating place. However while the Kestrel searches she is rarely looking for the rodents themselves. 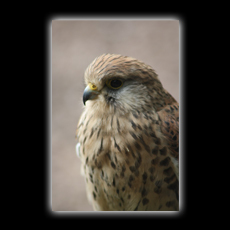 The Kestrel can see ultraviolet light, and the urine trails left by rodents fluoresce brightly to the Kestrel's eyes. By following the networks of trails, she watches carefully for movement at the end of the trail before stooping in for the attack, a practise that cleverly narrows down an entire field of hiding places to a few potential locations. The plumage differs from male to female, with the females being a brown colouration all over with black markings (as pictured) and the male having a blue head and tail. 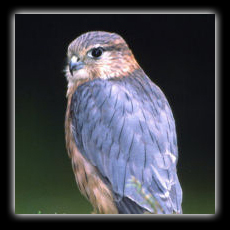 The Merlin is the smallest British species of bird of prey and is an amazing and challenging little bird to fly. While the females have a beautiful pale brown coloured plumage, the male as pictured has vibrant rust and slate blue plumage. These beautiful little Falcons had a special place in the medieval Falconry hierarchy as the bird of choice for the noble lady. Ladies on horseback would hunt Skylark with their Merlins, referred to as "larking about", which is where the phrase originated. Mary, Queen of Scots was an avid Falconer, an art she learnt during her time in France. She flew two Merlins, and greatly relished the sport of hawking they brought her. It was one of her biggest frustrations in her later years when imprisoned that she could no longer go out and exercise with her birds on horseback. The Merlin specialises in moorland hunting for small birds such as larks and pipits, which it catches at high speed on the wing. Although the noblemen would occasionally fly a Merlin to mock their wives, it is one of the most difficult birds to fly, needing delicate and precise weight control to get the best out of them. Eagles (like the Hawks & Buzzards) belong to the order Accipitriformes and the family Accipitridae. There are more than 60 species of Eagle in the World - most are from Eurasia and Afica. Outside Eurasia and Africa, only 14 known species can be found; 2 in North America, 9 in South America and 3 in Australia. Like Buzzards, Eagles are referred to as Broadwings. meaning that they are characterized with having long, broad wings and long flight feathers, which allow them to soar high above open plains and water, however some species of Eagle have shorter wings and longer tails which enables them to hunt their prey in the tight confines of forests. 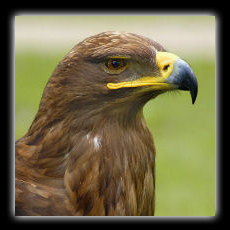 The Golden Eagle is probably the best known species of Eagle and is the most widely distributed species of Eagle in the World. Given their size and strength, most Eagles can hunt large prey such as deer and monkeys, whereas some species such as the Steppe Eagle are often found eating carrion but will kill mammals up to the size of a hare. The largest species of Eagle is known as the Harpy Eagle; weighing between 9 to 22lbs, standing at between 3-4ft and with a wingspan of between 5ft 9in to 7ft 4in (range is between that of a male and female - the female being larger). Most Eagles lay just 2 eggs when breeding, however the largest of the 2 chicks usually kills the younger, smaller chick, usually without any interference from the adult Eagles. The Eagles vision is among the sharpest of any animal in the World; some Eagles can spot the size of a rabbit up to 2 miles away! You will find below the species of Eagle that we currently have in our collection, along with information and photographs of each species. The Steppe Eagle is a medium sized Eagle, roughly half the size of its relative the Golden Eagle, and is found native to the Russian and Mongolian Steppes, as well as other areas of Eastern Europe and Central Asia. Despite their intimidating appearance, this species is almost exclusively a scavenger and will only occasionally take prey such as rabbit and partridge. It will also use its larger size to steal food off other birds. The Steppe Eagle is also migratory, and will travel to Africa. As it is very similar in behaviour and diet to its African relative, the Tawny Eagle, the two will often be seen at one kill. 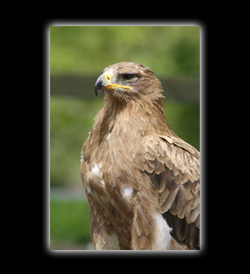 The Tawny Eagle is a medium sized Eagle found native to Africa. Despite the imposing appearance of this bird it is predominantly a scavenger and only hunts occasionally. They will use their size to steal food from other birds, and have also developed a habit of destroying termite mounds to eat the nutritious half protein, half fat termites within. Although the Tawny Eagle was thought to be the same as the Steppe Eagle for many years, studies of their anatomy and molecular analysis shows they are different. They do, however, meet during the Steppe Eagle's migration and are often seen at the same kills. Yes, Corvids are not Birds of Prey, but they certainly are an amazing family of birds that we adore and must have in our collection! Corvids belong to the order Passeriformes. Ravens, Crows and Jackdaws for example, belong to the genus Corvus, which make up only a third of the entire Corvidae family. Corvids are considered to be the most intelligent of birds. Studies have shown that they have demonstrated tool-making abilities and self-awareness in mirror tests. Corvids are found worldwide, the excemption being the Polar Ice Caps and also a small area of South America. The smallest of the Corvid family is the Dwart Jay weighing, on average, just 1.4oz and standing on average at just 8in tall, whereas the largest of the Corvids are the Thick-Billed Raven and the magnificent Common Raven, both of which can exceed 3lb in weight and stand over 26in in height on average. The diet of most of the Corvids consists of (due to most being omnivorous) nestlings, small mammals, insects, snails, worms, berries & fruits, seeds and of course carrion. As you have more than likely noticed, some Corvids, especially Crows, also eat food for human consumption. Most Corvids hide a lot of their food, often under stones or other objects, and come back for it later, almost always remembering were they hid it - and they often move their food from place to place to avoid it being stolen from others. Unlike Birds of Prey, were females are larger than males, it is the opposite with Corvids. Corvids have had a vital role in folklore, from Native Americans, the Celtics and Vikings to name only a few. You will find below the species of Corvids that we currently have in our collection, along with information and photographs of each species. The (Carrion) Crow is native to western Europe and eastern Asia. 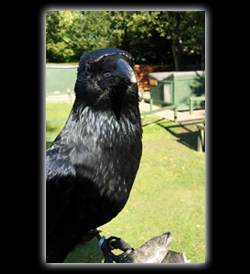 They are, like the Raven (see above) and most of the Corvidae family, an extremely intelligent bird. People believe Crows to be purely black, however this is not true. Upon closer inspection you will notice a green to purple sheen to their plumage. As their name suggests, their diet is mainly of Carrion, however they will also eat insects, earthworms, amphibians and they will steel eggs from other birds etc. They will, on average, lay 3-4 eggs and will incubate them for around 20 days. The young will then normally fledge the nest at about 30 days. It has been discovered that offspring from the previous year may stay to help rear the new hatchlings; it will look for food & assist in the feeding of the young. Our Crow, 'Deek', appeared in Season 1 of the popular Starz television series 'Outlander', alongside our Raven, 'Jake', and Jackdaw, 'Eddie'. 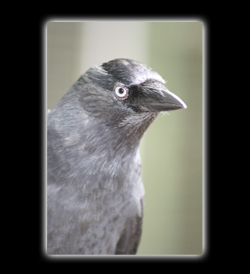 The (Western, or Eurasian/European) Jackdaw is much like a Carrion Crow (see above), only a lot smaller, and have a distinctive silver-sheen to the back of its head; it also has pale eyes whereas others in the Corvidae family do not. I can be found accross Europe, Asia & North Africa. The common name derives from the word "jack" - meaning "small", and "daw" the native English name for the bird. Jackdaws are voluble birds, meaning that they are very vocal. Social hierarchy is determined by supplanting (purely taking from another). fighting and threat displays. As you would have probably guessed, their diet consists mainly on that of carrion, food from rubbish bins, streets and gardens. They will also eat small rodents, bats, eggs & chicks from other birds. Jackdaws become sexually mature in their second year. In breeding season, when building nests, they often use hair, wool and dead grass. They will often have clutches averaging 4 eggs and are incubated (by the female) for approx. 18 days, and chicks then fledge from the nest at around 30 days, although their parents will often continue to feed them for another month or so. Our Jackdaw, 'Eddie', appeared in Season 1 of the popular Starz television series 'Outlander', alongside our Raven, 'Jake', and Crow, 'Deek'.